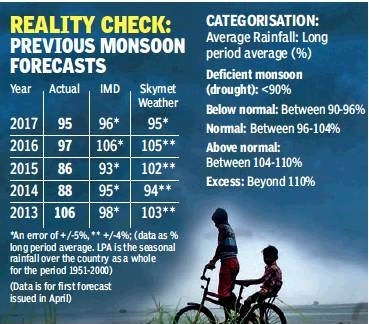 In what can spell good news for India’s farm sector and the economy overall, private weather forecast agency Skymet Weather has predicted ‘normal’ monsoon this year on the back of a statistically very high probability of good rains. In its first forecast, the agency ruled out the possibility of a drought year as a whole but warned of a “higher risk” of deficient rain in peninsular India and major portion of the northeastern part. It said, “The Monsoon 2018 is likely to remain normal at 100% (with an error margin of +/-5%) of the long period average of 887 mm from June to September”. The monsoon is considered as ‘normal’ if average rainfall is between 96-104% of the LPA. The average rainfall in ‘above normal’ monsoon is between 104-110% of LPA while anything beyond 110% of the LPA is considered as ‘excess’. Referring to probabilities in its 2018 forecast, Skymet Weather — which accurately predicted 2017 monsoon but not so well in 2015 — said there was a 55% chance of normal monsoon and east India, especially Bihar, Odisha, Jharkhand and West Bengal “are most likely to see normal monsoon rains”. The agency even spoke about 20% chance of ‘above normal’ and 5% chance of ‘excess’ rainfall during June-September period — this means there is quite a high probability for the monsoon to cross at least the ‘normal’ threshold this year. Anything less than 90% of the LPA is termed as a ‘deficient’ monsoon while 90-96% of the LPA is considered as ‘below normal’. The Skymet Weather’s forecast comes over a week ahead of IMD’s plan to make its formal monsoon prediction.